Albert Smiley built Lake Mohonk Mountain House in 1869 as a resort and conference center. When it opened, it boasted five hundred acres of undeveloped land, lakefront property, and powerful, wealthy guests. 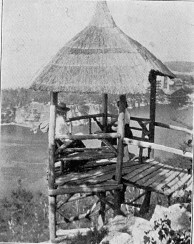 However, Mohonk was more than a playground for the rich: Smiley was a Quaker, and he used the resort from the beginning as a place to support various political causes. During his lifetime, Mohonk hosted conferences on everything from international arbitration to Native American rights. 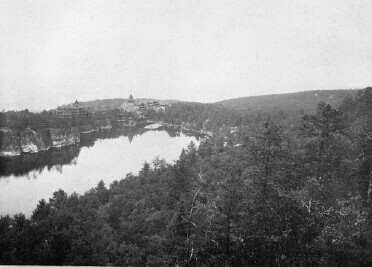 Vassar's relationship with Mohonk dated from 1872, when Frederick Thompson, a banker and Vassar trustee, invited the students and faculty to the hotel. Thompson had a longstanding relationship both with Vassar and with a number of other local schools. An active and generous trustee, the benefactor of the library annex to Main Building (1893-1959) was such a familiar figure around campus that Vassar students affectionately referred to him as '"Uncle Fred." He wanted to give students the opportunity to leave campus, and the Smiley resort must have seemed ideal for a weekend excursion from Vassar. Not only was it both secluded and conveniently located, its owners were themselves sympathetic towards Vassar. Daniel Smiley, Albert's younger brother, was a Vassar trustee, and Smiley himself was deeply interested in education. Before he opened his hotel, he had served as a principal at a number of different schools, and for the rest of his life continued to serve as a trustee for various colleges. Last Friday at noon we all assembled in the College parlors and from there 160 of us started in different conveyances. There were four or five large wagons and several carriages. We were in a party of six and happened to get a very comfortable carriage. We sang…and had a jolly time, we were among the first to extract and got there some time before six so what we had time to go up the mountain to Sky Top where we had a beautiful view of the country. We were able to see five states.... After tea, we had some dancing and at about 10:30 when the moon was out, we went out rowing. It was perfectly splendid. It was such a comfort to be out of hearing of bells and be able to go to bed when one wanted. Why really we did not feel any more within thousands of miles of Vassar… next morning we got up early and went to places around. It was dreadful climbing but I enjoyed it, I climbed up the crevice although Prof ordered us not to, and of course when we got up through safely, we felt victorious, for last week the seniors and juniors had been here too. Twelve o’clock we had dinner up on the top of a mountain one hundred and fifty feet high. We started for Vassar in the afternoon about 3 and got home late after a very jolly time. In 1889, these trips became annual excursions that occurred every October exclusively for the freshmen and senior classes. 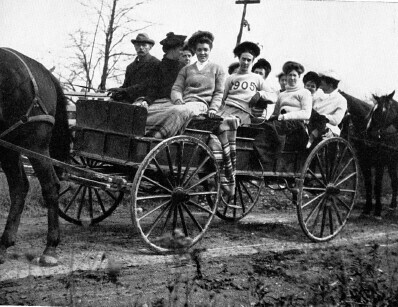 Due to an increased student population, the girls no longer stayed overnight, but drove the twenty miles Saturday morning. In order to arrive early enough, the college woke the students at quarter to six. 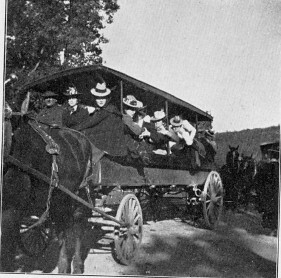 Usually, half of the students went by stagecoach, while the other half took the trolley to New Paltz and from there took "barges," or flat-bed wagons, to the hotel. The ride seems to have been as exciting an aspect of the trip as the experience at the resort itself. The students spent the trip singing and inventing songs dedicated to their class, the faculty, Mohonk, and Mr. Thompson and Mr. Smiley. ...Although cloudy, the rain held off, and the beauty of the scenery in all its autumnal glory was thoroughly appreciated. Every moment was spent in enjoying the beauties of the place. Sky Top was climbed, the crevice explored, and the clear waters of the lake ruffled by many oars. However, not much of this exercise was taken until a hearty lunch had subdued the keen appetites that had been sharpened by the long ride and exhilarating air. After lunch, Mr. Smiley invited them into the parlor. Giving a few words of welcome, he then introduced Governor Long, of Massachusetts, who has been presiding over the Indian Conference held at the lake during the last three weeks. He gave an interesting talk. Mrs. Hall, a guest of the hotel, sang some Scotch songs. Then Mr. Burton, who has made a life study of Indian melody, gave several examples of Indian poetry and war songs. These he sang first in Indian language and then literally translated in English. After this the entire delegation from the college, five hundred girls, rose and sang the Alma Mater. Eventually, the annual trips disappeared. Although Mrs. Thompson continued the tradition even after her husband’s death in 1899, the expense of the trip eventually became problematic. After 1909, the Thompson family only invited the senior class; shortly thereafter, they introduced a fee. Interest among Vassar students slowly diminished until by the early 1920’s the trip had ceased to exist. However, while the trips lasted, they were a major event in the students' years. Mohonk usually wove its way into the students' yearbooks and letters: the sketches and poems that students devoted to the occasion abound. 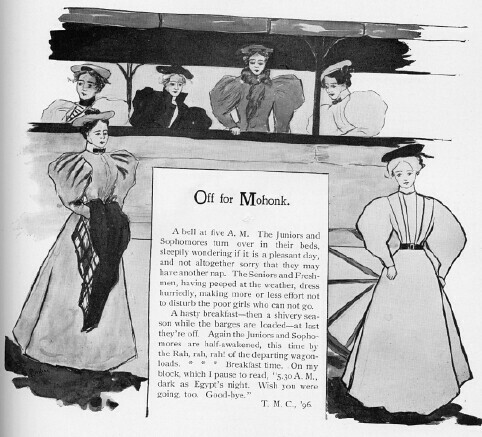 Particularly in the early years, because Vassar prohibited its students from leaving campus frequently, the girls deeply appreciated the escape from college life. Even years later, alumnae would look back on their days of hiking and rowing with fondness and gratitude to the men who made it possible. "Annual Mohonk Trip For Seniors and Freshmen." Poughkeepsie Daily Eagle 27 October 1902: 8. Barnes, Lucy Sellars. Student Letters: Box 64 VCSC, 26 May 1872. "Lake Mohonk." Poughkeepsie Eagle 21 May 1872. "Mohonk Day." Poughkeepsie Courier 25 October 1903. "Uncle Fred's Annual Excursion to Mohonk for Students." New York Herald 21 October 1895. "Uncle Fred Died." New York Tribune 11 April 1899. "Vassar College." New York Times 16 October 1892: 10.